Clericalism is the application of the formal, church-based, leadership or opinion of ordained clergy in matters of either the church or broader political and sociocultural import. In a pejorative manner, "clericalism" is often used to denote an ecclesiolatry approach to issues beyond the church by either clergy or their supporters, as well as to describe the cronyism and cloistered political environs of Christian denominational hierarchy, mainly in reference to the Roman Catholic Church. The phenomenon of clericalism is not restricted to the ordained (e.g., priests, ministers), as it occurs in purely secular guilds, such as academia, the legal and medical establishments, and the public-safety clergy: the police and military. Outside of Catholicism, clericalism is used to denote the divisions between ordained clergy and lay leaders in some Christian denominations while the older meaning of the term—an application of church-based theory or thought to secular issues—seems rather lost in most current uses of the term. In the aforementioned use of the term, it is important to discern the difference between a belief in a separation of church and state—which is not truly involving of clericalism—and the belief that church leadership should not be an internal and cloistered body that answers only to itself or that such leaders should not act as a powerful force in matters beyond the internal concerns of their church. Much debate in recent years over the sexual-abuse scandals in the Roman Catholic Church has brought about charges of "clericalism" in the sense of bishops and other leaders covering up the wrongdoing of clergy under their leadership. In this application of the term, clericalism has come to mean a division between ordained church leaders—that such leaders have an exclusive society unto themselves—and the lay followers. 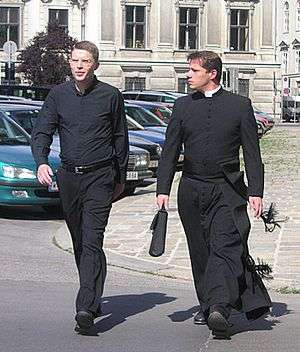 Much debate over clericalism appears to dwell on whether the high clergy should have as much control over church offices and functions as they do, and whether the hierarchical and authoritarian nature of the traditional Catholic systems of promotion for clergy is effective in contemporary society. Again, while the Catholic Church is most commonly at the center of issues germane to clericalism, it is not the only denomination or religion in which charges of clericalism have been brought forth by those who feel the clergy has too much influence or should be reformed. Therefore, the debate over clericalism and anti-clericalism is often really a debate over how and by whom a religious organization (denomination) should be led and directed. In political history of various countries, distinctive radicalized forms of nationalistic clericalism or clerical nationalism (clero-nationalism or clerico-nationalism) were emerging on the far-right of the political spectrum, specially during the interwar period in the first half of 20th century. ↑ Matthew Feldman; Marius Turda; Tudor Georgescu (31 October 2013). Clerical Fascism in Interwar Europe. Routledge. pp. 227–. ISBN 978-1-317-96899-3.